Happy decorating! 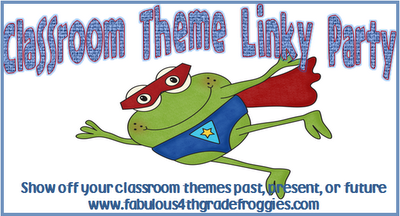 I'd love to hear about more themes you have used or would like to use in your classroom! Oh, and by the way, the first 3 people to post in response to this will get my theme pack for FREE!!! Be sure to leave your email so I can send it to you right away! It is very cute! Love the ideas bright colors always make the classroom look better! Love the ideas. You get the first FREE PACK!!! :0) Thanks for stopping by! You're NUMBER 2 for the FREE PACK!!! :0) So glad you love the bright colors like me! I love bright colors too! Cute! Nicole, you're NUMBER 3!!! Congrats! Okay, friends, I will send your packs now. They may take a few minutes to download because they are large files. Thanks so much for stopping by! Thanks for linking up! I love the colors you chose! Looks like I just missed it :(. Congrats everyone! I live on this computer...I'm always telling myself to "step. away. from. the. computer." and when I do...THIS!!!!!!! Any ideas or suggestions for blog swap post? Hey there! You're posting on my blog, right? I am trying to keep everything straight! :0) You can post about whatever you like! Just email me at mrsbteaches2@gmail.com when you're done. Send it in html so I'll have the pics, too. I can't wait!!! I love the bright colors too and am going with that theme next year. Your set looks great!I found your adorable blog through the forum on Teachers Notebook. Too cute! I love bright colors! It makes a room seem so cheery! I am your newest follower!